I was really chuffed when Portia Lawrie from the Makery blog asked me to be in the blogger line up for this years Refashioners series. I had avidly followed last years #jeanius themed blog tour and community challenge on Instagram and loved how creative and innovative everyone was! That being said, when I learned what the theme was for this year I got a little worried! Men’s suits are not really something I’ve had much experience with in the past either making, wearing or buying them! I thought I’d start with finding a suit so I set out to scour charity shops for a decent one. It actually took me a while to just find a complete suit! 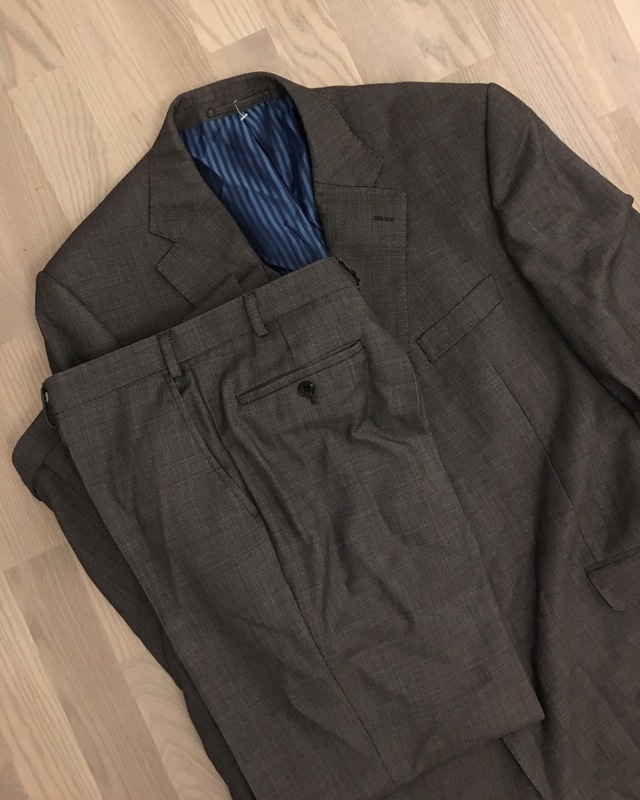 I ended up with a bog standard M&S wool suit in a browny grey colour (despite having all my fingers and toes crossed that I’d find some fabulous plaids or tweeds). I quite liked the faint pattern of the fabric and it had a been of a sheen to it. I was lucky that it was an extra tall suit too so I had a little more fabric to work with! After that I was kind of stumped for ideas! I couldn’t seem to decide on what to do about the design so I thought I’d start by taking the entire thing apart. That was an entire evening of me, Netflix and a seam ripper. My main concern with all my ideas is that it just didn’t seem like enough fabric! (I was proven very wrong about that by the end of my project but at the time I couldn’t wrap my head around it). I am way too used to having a few metres available and being able to just cut whatever I needed. I ended up starting with just a pencil skirt which then got extended into a full dress as I realised just how much fabric I had! 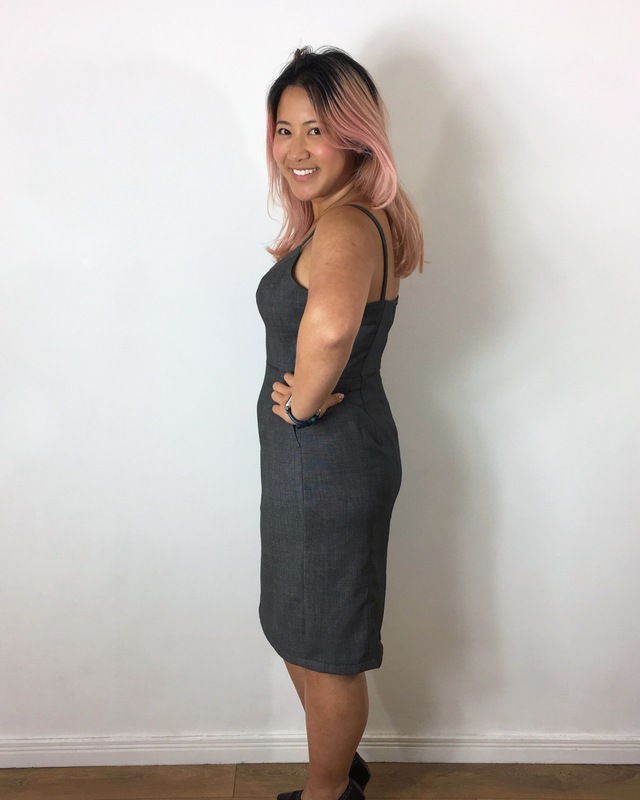 I used the Butterick 6453 pattern as a rough base for this dress (though to be honest hardly any of the pattern pieces ended up the same). I’d used it before so I knew what to do to get the fit right which meant one less thing to worry about! 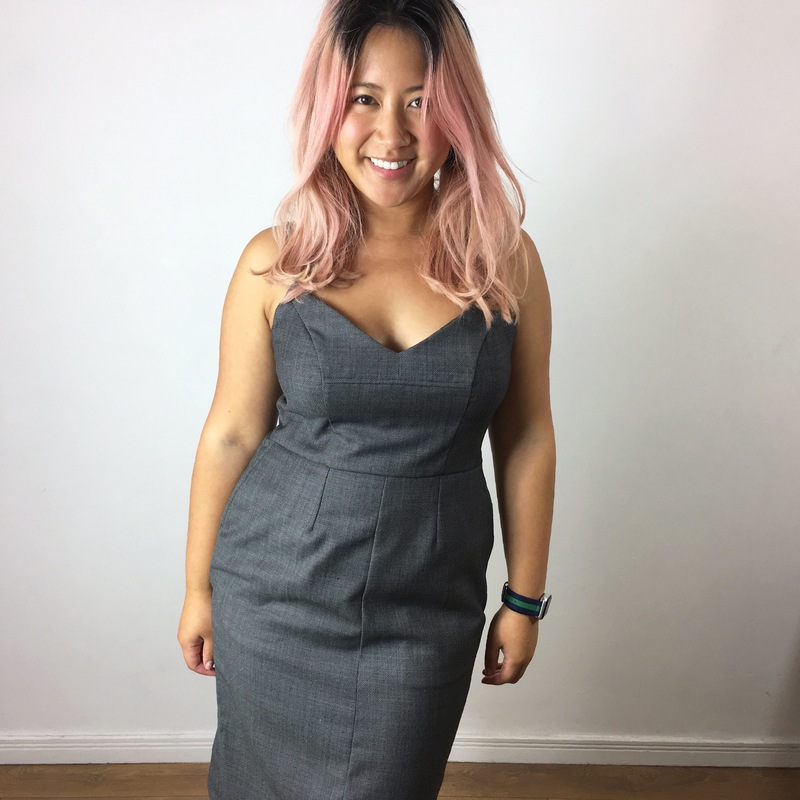 The front of the skirt is made from the front of the suit trousers. I even kept the pockets in place! The top of the dress was grafted together from one of the back pant legs and the sleeves. It was really useful chopping up the pattern into smaller pieces which could fit more easily onto the suit fabric. The back of the skirt is made with a panel from the back trousers and the back of the jacket. I really wanted to keep the back trouser pocket in place and functional. I liked the idea of keeping the “original” features! I added an invisible zip to the centre back to close and kept a vent in the back of the skirt so I can walk. It’s far from perfect. You can see where my seams and darts don’t quite match up. Saying that, I really love how this turned out! It’s fitting well and so wearable. Plus I actually have loads of fabric left over (I’m planning a waist corset out of the rest of it). I hope you guys all try your hand at this refashion challenge – it’s been so much fun to do! To keep up with The Refashioners, check out Portia’s blog here! You can also see her Pinterest board for more inspiration! Look out for the community challenge in October – there are loads of AMAZING prizes to be won which you can check out here! A stunning job, Emily! The fit of this dress is fantastic and the details from the suit work really well with the design! Wow this is amazing! It’s so different from the original suit. Thanks! It’s quite a contrast, right? I really wanted to make something that was completely different to the original! I mean, I already knew you had skills, but WOAH! This is skills plus great vision and style! NICE! This is totally gorgeous! Great job!